Also serving communities of Turtle Creek, Murrysville. There are 93 Assisted Living Facilities in the Monroeville area, with 5 in Monroeville and 88 nearby. The average cost of assisted living in Monroeville is $3,390 per month. This is higher than the national median of $3,346. Cheaper nearby regions include Duquesne with an average starting cost of $2,400. To help you with your search, browse the 391 reviews below for assisted living facilities in Monroeville. On average, consumers rate assisted living in Monroeville 3.8 out of 5 stars. Better rated regions include Duquesne with an average rating of 5.0 out of 5 stars. Caring.com has helped thousands of families find high-quality senior care. 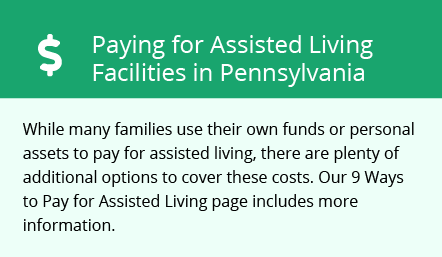 To speak with one of our Family Advisors about assisted living options and costs in Monroeville, call (855) 863-8283. Monroeville, nicknamed the Crossroads of Western Pennsylvania, is located about 13 miles from Pittsburgh. The town has a population of just over 28,000 residents, and over 22 percent of them are 65 years of age or older. Within Monroeville town limits, there are 13 assisted living facilities. Another 205 facilities are located in surrounding communities, including Pittsburgh. Monroeville’s assisted living facilities are licensed by the Pennsylvania Department of Human Services. These facilities provide supervision, personal care and other services to four or more seniors. While Monroeville offers limited arts and culture opportunities, seniors can travel to Pittsburgh to enjoy the city’s many attractions. Some, such as the Fort Pitt Museum and the Carnegie Museum of Art and Natural History, offer discounted rates for seniors. Monroeville offers many public transit options for its senior residents. The Port Authority of Allegheny County operates a fleet of buses and trains, and seniors can get free bus passes. Seniors can also reserve door-to-door transportation through the county’s Access bus service. Air quality in the Pittsburgh metropolitan area is poor, according to rankings released by the American Lung Association. Pittsburgh ranks in the top 10 most polluted cities in the nation for short-term and year-round particle pollution. Allegheny County is a member of the AARP Network of Age-Friendly Communities, meaning that its elected leadership “has made the commitment to actively work toward making their town, city or county a great place for people of all ages,” according to AARP. In Monroeville, the cost of living is 4.7 percent lower than the U.S. average. Seniors can expect to pay significantly less than the national norm for housing and healthcare, though transportation costs are higher. Seniors may choose to retire to Monroeville to take advantage of these lower costs. Monroeville’s crime rate is higher than the national average, and it’s also higher than 77 percent of Pennsylvania’s communities. Residents of this town have a 1 in 49 chance of becoming a victim of a crime, so seniors may want to take precautions. Assisted Living costs in Monroeville start around $3,390 per month on average, while the nationwide average cost of assisted living is $4,000 per month, according to the latest figures from Genworth’s Cost of Care Survey. It’s important to note that assisted living rates in Monroeville and the surrounding suburbs can vary widely based on factors such as location, the level of care needed, apartment size and the types of amenities offered at each community. Seniors who live in one of Monroeville’s assisted living facilities may be eligible to receive assistance from Community HealthChoices, a Medicaid waiver program. Seniors who receive federal SSI payments may be eligible to receive additional funding from the optional state supplementation program. To see a list of free assisted living resources in Monroeville, please visit our Assisted Living in Pennsylvania page. Monroeville-area assisted living communities must adhere to the comprehensive set of state laws and regulations that all assisted living communities in Pennsylvania are required to follow. Visit our Assisted Living in Pennsylvania page for more information about these laws.